Inspired from the book: Applique with Attitude from Piece O'Cake Designs, I put together this fun little applique wall hanging today. I've been missing applique sewing and even though my wool project is allllmmmmoooossst finished and I really should focus on that, I just don't feel like sewing with wool when it's summer. This one is light and cool to sew and provides the perfect hand sewing I've been craving during my morning coffee on the patio. Also...LOTS going on here at the ol' blog. Click HERE to participate in my Tuesday Archives Give-Away. 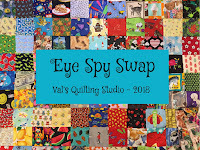 Thanks to everyone who participated in our Eye Spy Swap. Piggy Bank Savers...mark your calendars for July 6th...as that's when we empty and count our quilty savings for the year. I think I'm going to beat hubby this year! A very fun new project! Enjoy your morning stitching time. A lovely summery wall hanging, Val. 'Tis perfect for lazy stitching days on the patio. I love your applique wall hanging Val! I'm with you, I'd rather do wool in winter. Your project is wonderful. You're right about wool applique in the summer - just doesn't seem like a good fit, lol! Your new project is darling. Have fun FMQing. If I can do it, you can do it!!! 6th Annual Piggy Bank Challenge BEGINS! LINKY: 5th Annual Piggy Bank Challenge! !